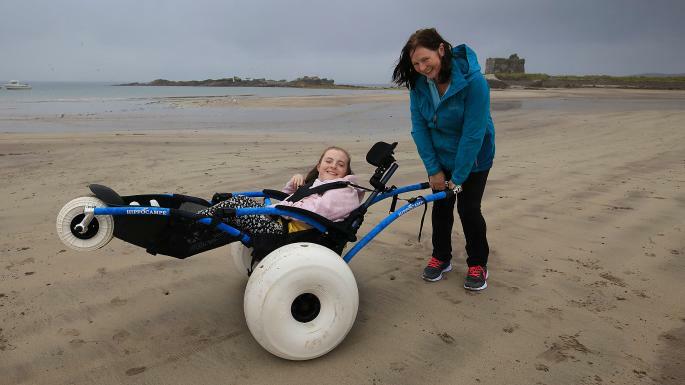 All terrain: Since 2002, the Hippocampe wheelchair offers individuals with disabilities accessibility to difficult terrains, impossible in a standard wheelchair: beach, sand, swimming area, hiking trails, snow, mountain. On your own or accompanied: Towed, pushed or self-propelled, the Hippocampe chair offers autonomy to its user, a third party can assist the more heavily handicapped with its push bar or traction kit. Comfortable: The seat is composed of a thick and hydrophobic foam that does not absorb water and dries quickly. The blue and pink sheathed tubes are comfortable to the touch and do not heat up in the sun. Revolutionary: The Hippocampe all-terrain beach chair is recognized all around the world. 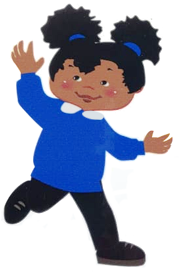 Its first goal is to make the beach and water-related activities accessible. Today it equips more than 200 beaches in France and abroad. Design and adaptable: Its youthful look and modern silhouette make it your ideal companion. 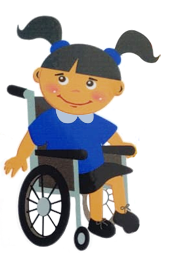 The Hippocampe wheelchair has received numerous awards for its design. It is just at usable on the beach as on the snow, and can be transformed into a ski chair thanks to its front and rear ski kits (as an option). 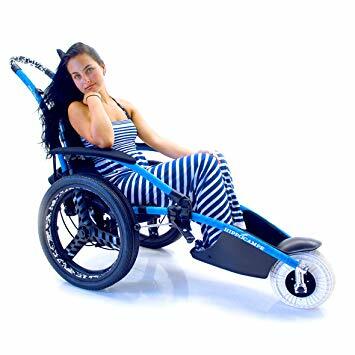 Lightweight, collapsible, and easily transportable: Its small size, fold-down backrest, removable push bar and wheels and its weight of 17 kg (37.5 lb.) make it easily transportable and convenient to store in your home or in its transport bag (as an option).